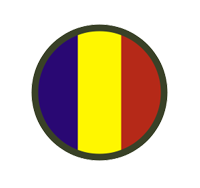 Decision Lens helps you align resources to achieve mission critical objectives. Our platform gives you transparency into the trade-off process and helps you create a plan that evolves with your agency. 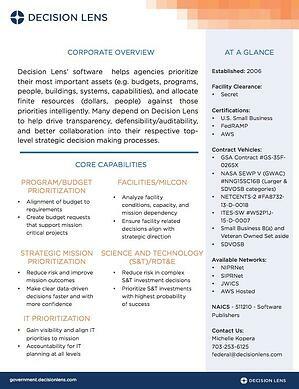 Leading Civilian and Defense Agencies utilizing Decision Lens are able to prioritize and have full visibility into all resources. Decision Lens is a FedRAMP Compliant Cloud Service Provider (CSP). Available on: SIPRNet, NIPRNet, JWICS, and others. Having information without a way to interpret it is like searching for a needle in a haystack. Our powerful analytic visuals remove the guesswork to help you identify the insights you need and communicate it effectively. At Decision Lens, information security is not an afterthought, but a daily focus. Every technical element built into our platform makes us a secure, readily available cloud-hosted Software as a Service (SaaS). We are FedRAMP-certified and hosted on the authorized Amazon Web Services (AWS) Infrastructure as a Service (IaaS), with an authorization to operate (ATO) from General Services Administration (GSA). We feature information security practices that are built on industry best practices and leverage known, trustworthy infrastructure services to comply with robust security framework standards. The Decision Lens Professional Services team has decades of experience solving the industry specific problems you’re working on. Our team is comprised of talented individuals who are committed to your successful implementation and overall organizational adoption of the Decision Lens process. Whether you’re a State Asset Management Team or a Federal Budgeting Group, we’ve got the expertise to assist you in your solution oriented approach to planning, prioritization, and resource allocation. 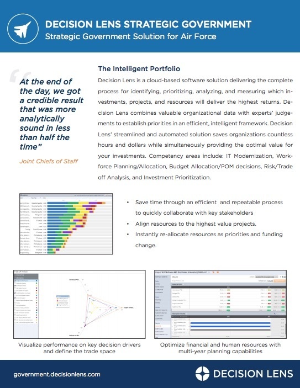 Decision Lens Professional Services fully enables organizations to be more process-driven and successful with their strategic prioritization efforts. Our experienced Client Managers, Analytics Experts, and Education Instructors guide organizations through implementation, execution, and analytical discovery utilizing the Decision Lens solution. Decision Lens Professional Services provides a range of offerings that can be custom tailored to your specific organizational needs. The Decision Lens platform is rooted in the Analytic Hierarchy Process (AHP) which was created at the Wharton School of Business by Dr. Thomas Saaty. It’s based on mathematics and psychology and has been applied worldwide to various complex decision making scenarios, including everything from corporate budget planning and vendor selection to player selection in the NFL. 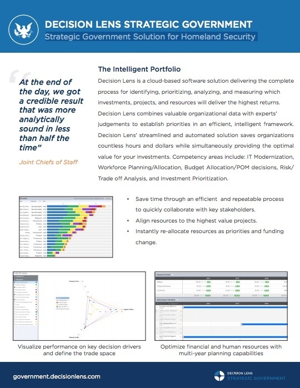 Our goal is to guarantee that you get the most out of the Decision Lens software. Decision Lens University (DLU) was created to ensure that you receive the value and continued support you expect from Decision Lens. With a host of classes, formats, and options, we make sure you are comfortable with our methodology to reach your objectives as painlessly as possible. Decision Lens University operates in all forms of learning to continue supporting you while using our software.